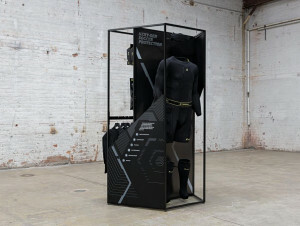 The concept for the fixture was conceived as a “Superhero’s Closet,” designed to invite players to suit up, unleashing their potential on the field by allowing them to be fearless. The core of this inspiration came from the product itself. In an industry of flash and color, Storelli stands out with their edgy, black gear that resembles armor.